Chilexpress is a leading company in the Chilean courier market with over 300 branches all over the country, offering full national coverage and worldwide presence, due to the strategic alliances with recognized international courier companies. With over 20 years of experience, Chilexpress specializes in courier, express carrier, transportation, logistics and international trade services, collection and wire transfers, both in Chile and abroad. Furthermore its branches manage other operations, such as ticket sales, collection of service fees, cell phone credit refills, among others. Both the Innovation and the use of advanced technology are Chilexpress’s most important values, since it can offer outstanding delivery times to its customers, ensuring confidence and security to those hiring their services. Bearing this in mind, in the last couple of months, the company’s main objective was to upgrade its Customer Service system in all its premises, starting with those getting a lot of customers daily. 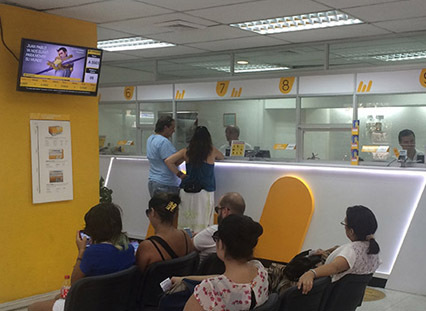 After analyzing this situation, a complete solution was found to reduce customer waiting time in the branches; to improve customer experience during waiting time; to optimize employees productivity and to obtain customer information when registering for assistance. Wavetec’s proposed solution to meet these objectives focused on technological integration consisting of self-managed kiosks placed at the entrance of the care centers. The customers enter their personal information on the displays, such as name, identification number, identify which action is needed and receive an appointment number to be served. The self-service terminals are integrated with Chilexpress’s management software in such a way that when the employee calls the appointment number, the displays shows him/her the data entered by the customer at the interactive kiosk display, including the action needed. In doing so, there is no need for the operator to enter the customer information again (Name, Tax identification number, cell phone number, etc. ), which saves valuable time in each service appointment. Moreover, the installed system includes a 40-inch LCD display technology, where the customers can see the appointment number to be served at any moment. This digital signage system provides customers with the company’s institutional and promotional content during their waiting time, and informs and entertains those who are waiting to be served. It is worth mentioning that the system developed by Wavetec for Chilexpress is centralized. Wavetec’s technological development was designed to be implemented at the 35 branches with a large demand of customers, to be later extended to the rest of the care centers at different stages. Among the first measured results, service time for each customer was reduced to between 15 seconds and one minute with this implementation. These times represent a significant impact, if we consider that the branches of the company with a large demand of customers receive an average of 400 people per day. This shows the evolution of Chilexpress through Wavetec’s implementation. Wavetec has a track record of providing solutions aimed at building valuable experiences within the service area, for consumers and organizations. Wavetec’s development of digital signage, waiting line management systems, and experience measurement provide complete solutions tailored to meet every client’s needs in businesses such as retail, banking, or health from over 60 countries. The high quality and technological innovation standards have paved the way for Wavetec’s work on solid projects for companies such as, Interbank, Barclays, Emirates Airlines, Tesco, LIDL Germany, and in this case, Chilexpress.